Are you a fan of vintage fashion? Do you like nothing better than dressing up in outfits that speak of times past? Fans of vintage clothing have a strong idea of their aesthetic leanings, and these preferences usually spill over into their interiors. Dressing in stylish, retro clothing is a design statement, and so it makes sense that you might want to carry that love of all things vintage into your home. If you love to dress with old-style glamor, but aren’t quite sure how to translate that to your home, read on for tips and tricks on vintage décor that delivers. If you like to channel 1920s flapper girls with elfin bob haircuts and shimmering, fringed and beaded dresses, then the perfect interior for you is the art deco style. This classic era of the 1920s was a real style revolution. 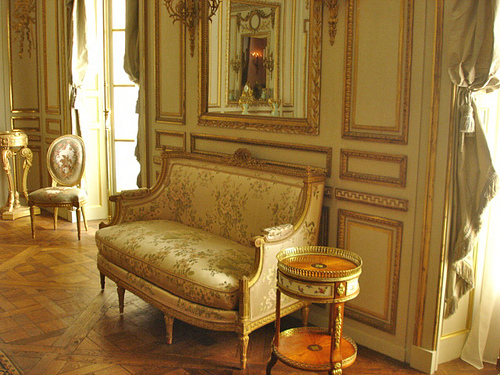 Suddenly, interiors were opulent and bold, with strong, straight lines and geometric shapes. Get this look today by filling your interiors with muscular, extravagant furnishings and designs that reference the mood of luxury ocean liners and shiny vintage automobiles. Materials like chrome and Bakelite were popular in fashionable 1920s homes, and you should also keep a look out for glass and mirrored coffee tables, drinks cabinets with chrome detailing, Bakelite accessories, sofas and arm chairs in blocky geometric shapes all in shades of black, gold and cream. Continue the streamlined look with window treatments that echo the period, such as classic look shutters lacquered in a high gloss finish for ultra glam impact. To finish off, lay down thick pale carpets, install opaque glass light fittings and create interest with monochrome geometric shapes and stripes in textiles and wall coverings. Do you like to dress in 1940s-style rosebud print tea dresses with seamed stockings and block-heeled shoes? If so, then your perfect interior should feature a dining table with heavy chenille fringed cloth, porcelain tea cups and saucers with floral designs, tiered cake stands and doilies on plates. Elsewhere, find sofas and armchairs with blowzy flower motifs and use shades such as wine and teal in the drawing room to emphasize the retro feel. In the kitchen, duck egg blues and greens should be in evidence either in the guise of a painted wooden dresser lined up with attractive enamelware, or in table linens and rag rugs. If your wardrobe is full of dresses from the 1950s and 60s, surround yourself with mid-century modern furnishings that are cool, clean and super sleek. Check out the stunning interiors in the TV show Mad Men for inspiration and ideas. Use colors like orange, mustard, pea green, purple and sienna to revive the authentic look of the classic mid-century mood at home. Sofas with sinuous wooden legs and arms, lozenge-shaped sideboards with sliding doors and suspended shelving with a Scandinavian twist are all signature styles that underline this strong interior theme. Why not dress your home in vintage style to suit your personal fashion tastes? You could be pleasantly surprised at the chic and unique ideas this fresh angle inspires.